Remember our Blue Bell & Magic Shell Giveaway from a couple of weeks ago? 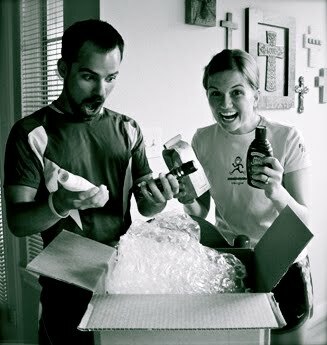 Well check out this hilarious post written by our winners Stephanie & DC from Houston. I like them. When they win, they commit. What a sweet post to Thank you guys for the giveaway :) I love their photos that they took to go along with it too! If I didn't know any better, I'd say a couplecrush is forming! :) So nice! lb, a couple crush indeed! anyone who can have that much fun with packaging peanuts is a no brainer. P.s. In looking at your posts, I may have pretended to be in Maui this week, maybe. Atleast, I pretended until I realized how much laundry needed (still needs) to be done! P.s.s. Fact: I have told many friends about your blog (which causes me to make a heart shape with my hands indicating how much I like it). I must say, Today's Letters is spreading like wild fire here in College Station. Good thing there isn't a burn ban (bahahahaha--terrible joke, sorry)! katie, glad you could vicariously live through twinner and i last week (even in the midst of mt. laundry). and thanks for passing on the blog to your aggie compadres. i have much love for all of you down in college station. sending you three legs kicks and one big fat WHOOP!